There seems to be a writing tip that everyone knows – write what you know. Some take it literally and set books in a time or a politically landscape they know, or have a character who works in the same profession as they do or they use their experiences like break-ups or redundancy as plot devices. Or they take this tip as encouraging writers to write about universal subjects we all know things about – love, loss, friendship etc. There is no right or wrong way to write what you know but I think it sometimes can be a blockage to creative ideas because it can breed fear that you can’t write about things that you don’t know about. But do we ever really not know about something? We are surrounded by stories – on the internet, on TV, in films and in music and from people we know. Is there an event we haven’t heard something about? And even if it’s not us as writers experiencing it, we can still think about how we would think or feel or act if it was happening to us. Writers have to create a world for their book which a reader can become fully immersed in – to do this we need to use imagination but also an understanding of real things – how people talk in real life, for example, and somehow produce it on a page and allow a reader to suspend any disbelief that the book world isn’t real. I don’t think this is easier or harder if you’re writing about something you have lived through or not. In fact, it can be harder if you have lived through it as what happened for “real” may come across contrived on the page. I think all writers will slip some things about their life into their writing along the way but we shouldn’t be focused on putting our lives on the page. Writing about a world outside your own can be challenging and exciting and can actually help you discover things about yourself you never knew. 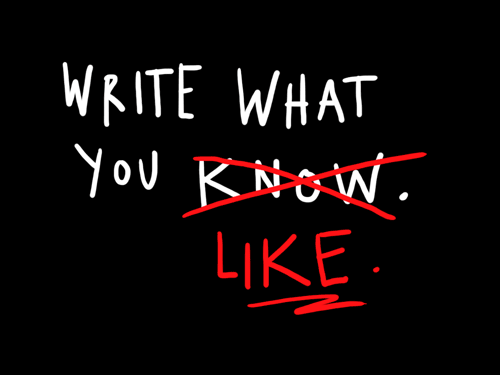 Do you think write what you know is a useful tip or outdated idea? It does seem quite a strange saying for a ‘creative’ form of expression. The whole point of creativity is that you make things up – but then I suppose creative inspiration often comes from what you know. Like most writing rules, it’s probably there to be followed and then broken… Good question and great post. Thanks. It’s true – there are so many writing rules and tips but you need to do things your own way! I think to some extent writers can experiment with ideas and topics which they may not know a lot about, but writing what you know about will probably be the best writing you can do…? But I definitely agree with you – going outside the box is a great challenge and exciting. I think you’ll always have to use your imagination though unless you’re writing a memoir and that’s usually the best part! I don’t know…I’m always reading the author’s bio or “thank-you” page in the back of the story when I finish, and many writers have to do a lot of research and consult with different experts to make the details of their plot seem really realistic. By the time they’ve finished their research, I suppose they’re writing about what they know…But I agree with your little picture that you posted. As long as you’re writing about what you like, it will make a great story. You’re probably either writing about something that you already know (and like), or you’re passionate enough that you want to do the groundwork to figure it out before you start writing about it. Definitely – if you what to write about something that requires socialist / technical knowledge then doing research / asking experts is a great idea and will add realism and also shows that you don’t have to stick with what you know, you can learn new things through writing! I tend to discover when I write about what I know that I don’t actually know half as much as I think I do. I also find that what I know – for example, my job – gives me little inspiration for my writing. Yes, there will always be a touch of what I know about my writing, a little bit of me that I transfer onto characters, or a familiar landscape, but writing for me is a form of escapism and for that I need to get away from my real life and explore new things. That’s such a good point – I think I’ve always loved to read because of the escapism it provides and I think writing gives me more of that! I think it’s a little bit outdated, and it has the potential to limit the writer. I think you’re right on the money. Not only write what you like, but write what you WANT to know. I love researching things that I may never need to know, just because I’m writing. When it comes to write what you know, I think ‘they’ are talking about the emotions, motivations, etc that makes a character tick. Now that, I think, would be difficult to write if you’ve never experienced. Write what you want to know is such a good motto! I’ve always thought the whole “write what you know” thing is a bit strange. Sure, it may be a bit more straightforward in the beginning but in reality life is often too dull to make a novel! And when thriller authors write about murders and fantasy authors write about dragons, I’m guessing that they haven’t experienced those things first hand (but who knows?!). Saying that, I agree with kquintana in that certain emotions are easier to write about when you’ve experienced them. Haha true although sometimes I hope the fantasy worlds are real i.e. Harry Potter 🙂 I totally agree!